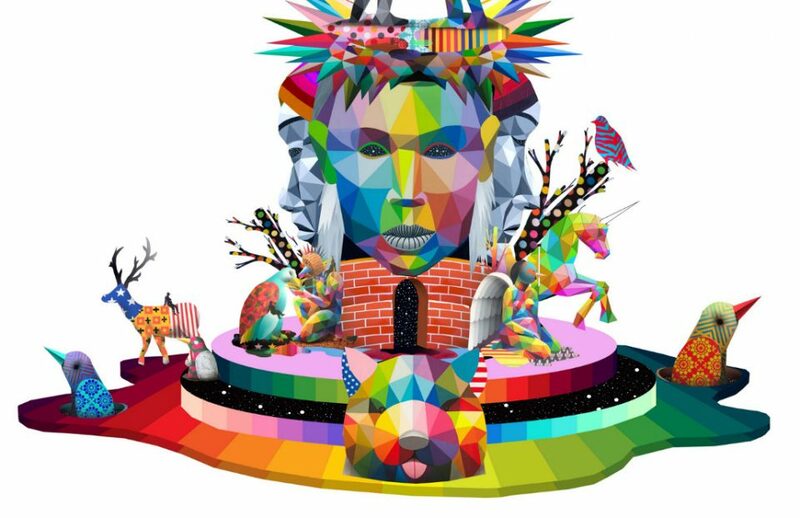 Best known for his vivid geometric murals full of fantastical animals, which brighten up everything from derelict churches to fleets of freighters, street artist Okuda San Miguel has crafted a massive 3D sculptural centerpiece for the annual Fallas celebration in Valencia, Spain. The 100-foot-tall cardboard sculpture stood for just four days before it was ritualistically burned, along with the rest of the art created for the festival, in a celebration of ephemeral human achievements. 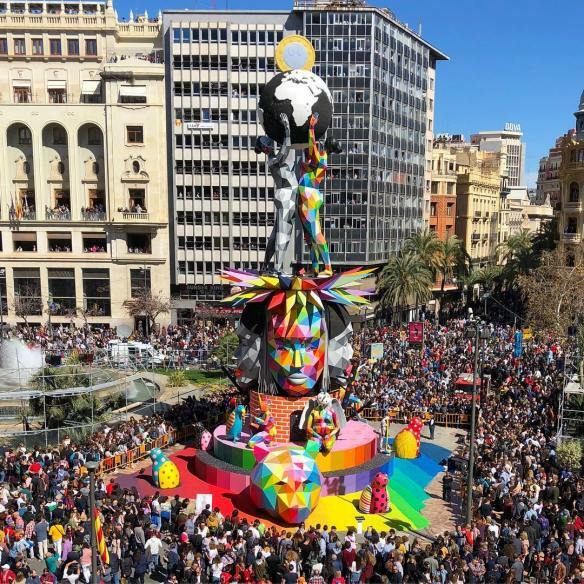 The festival, honoring Saint Joseph, sees three million visitors descend upon a city of one million to dance, celebrate the beginning of Spring, drink sangria in the streets and watch a bunch of things burn. Among the sculptural ‘sacrifices’ are traditionally a series of giant ‘ninots’ (puppets or dolls) including satirical figures. This year, it was Donald Trump, Vladimir Putin and Kim Jong Un. Just before midnight on ‘La Crema,’ the last day of the festival, the crowds begin changing and the streetlights are turned off before fireworks explode and everything is set ablaze. Li vaig demanar a l’equip de Reyes Martí que cuidara molt la Cremà per ser el moment que dóna sentit a la festa de les #falles i el seu gran impacte mediàtic . I en novembre els vaig acompanyar a visitar la falla als tallers per què comprovaren amb els #artistesfallers @latorreysanz les seues possibilitats. És quedaren enamorats del colorit d’ @okudart i ahir, a pesar de les inclemències metereològiques i del contratemps familiar ens oferiren un autèntic show per a una cremà de flama neta. Possiblement la cremà més colorida i espectacular que jo recorde.